Cloud-based Practice Management (PM) software systems offer an affordable and secure substitute for installing a local server for healthcare practices. Practices of all sizes have been switching to the cloud in great numbers in the last couple of years to influence the available healthcare IT technology and lessen the burden of maintaining an individual server and separate IT staff to look after it. You can save a lot of money if you prefer cloud-based EMR over web-based EMR. An Electronic Medical Records (EMR) software system that uses the cloud has an average initial cost of $3,600 while a server-based system can cost over $40,000. In a server-based system, once you factor in the loss of productivity due to the increased difficulties of implementation of these types of systems, the first year cost can be as much as $150,000. Therefore, the cloud-based EMR software is more cost-effective doubtlessly. Clouds alleviate the need for hardware infrastructure and the need to invest in these technologies, leading to a reduction of costs for the practice. Not only does it mean to install or maintain hardware save money initially, it means that there is no need to hire IT staff, which translates into long-term savings. Cloud-based EHR software systems are very easy and simple to implement. Electronic Health Records (EHR) software that run on the web instead of the computer, means no hardware or software installation. Practices can avoid disruption of cash flow and get a faster ROI with an implementation system that is much faster than Cloud-Based EMR software. It can get really difficult for practices to afford a full-time IT staff to handle maintenance and security issues of the server. The cloud system providers, provide this full-time support as part of the subscription fee. You can also get help using the Patient Portal. Cloud-Based EMR software turns out to be very cost effective for solo and small practices. 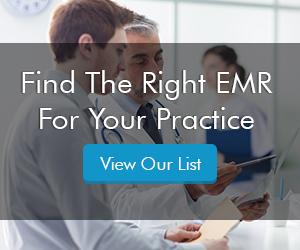 With its low initial implementation cost and decreased staffing needs, it gives these practices a competitive edge over the practices that use server-based EMRs. Healthcare providers ensure their staffs have access to information anywhere and anytime by storing data in the cloud. This gives practices the flexibility to handle tasks, even when away from the office. Cloud-based systems are used for everything from banking to shopping on Amazon. These systems have a proven model of security with bank-level security and high-level encryption methods that make data unreadable, even if a security breach occurs. Practices with Cloud-Based Practice Management (PM) software systems are protected in the event of a fire, flood, tornado, or any other natural disaster. These software systems offer continuous backups and store all data in various secured locations. If a disaster strikes, the practice can still access its data from any computer with an internet connection. Cloud-based systems are built to be mobile. This allows the practices to perform necessary tasks anytime, anywhere and also ensures higher satisfaction. A recent survey found out that providers using EHR/PM software via mobile systems showed double satisfaction than other platforms.